On January 31, Lloyd Center staff and volunteers completed the 29th annual survey of waterfowl that spend the winter in estuaries and coastal ponds in our region. 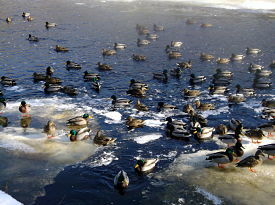 The survey took place from Apponagansett Bay in Dartmouth, Massachusetts to the Sakonnet River in Tiverton, Rhode Island and consisted of an early December (“early meteorological winter”) and a late January (“late meteorological winter”) survey, an arrangement which covers the breadth of the migration season of the various species of waterfowl. This year’s extremely mild weather pattern resulted in warm temperatures and very little ice coverage for both counts. The early winter survey was held on December 6, and while totals (4,395) were only slightly lower than last December, they were the fifth lowest totals since December 2000. This includes the third lowest December tally for American Black Duck, a species known to be in long term decline. 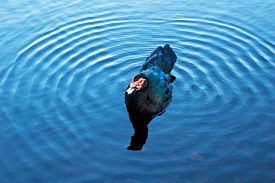 While the migratory population of black ducks seen here in winter comes largely from a robust population breeding in Maine and Canada, black ducks have declined as a breeding duck in Massachusetts. Other notable declines included Ruddy Duck, a relatively abundant December diver, Mute Swan, and Common Eider. 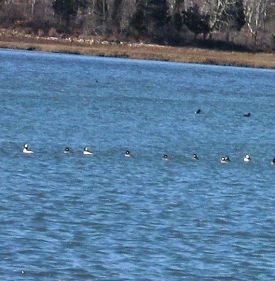 Eiders were virtually absent from the Westport Harbor, the one site where eiders are usually highly abundant. No major changes from the prior December occurred for the more common species (Canada Goose, American Black Duck, Mallard, Bufflehead). Canada Goose numbers while higher, were still far below the average numbers for December counts. The top five most abundant species for the December count were Canada Goose, Bufflehead, American Black Duck, American Wigeon, and Mallard. Bufflehead increased from last December. Wigeon were the big surprise, reaching their highest abundance level ever recorded with highest numbers at Quicksand Pond (320), the site with the highest overall December abundance. This year also had the second highest Gadwall totals, and the highest Hooded Merganser totals ever recorded. The unseasonably warm temperatures and little to no ice coverage greatly increased available open water for the much larger number of waterfowl that had migrated south in time for the January count. Numbers (8,593) soared to the highest observed total since 2003. Records for American Wigeon, Gadwall, and Hooded Merganser which were broken for the December count fell once again in January. This includes 425 American Wigeon returning to Quicksand Pond, which again had large numbers of waterfowl. Other increases from a year ago included healthy surges in the most common divers, Bufflehead and Red-breasted Merganser, and an increase in American Black Ducks, which benefitted from the lack of ice this January. Ruddy Ducks increased to one of the highest counts on record for the month with the lack of ice on Long Pond where the species has often been most abundant, a definite factor. While Canada Goose and Mallard showed no change from a year ago, these species combined (776 Canada Goose, 297 Mallard) helped put Nonquit Pond at the top for abundance overall (1,168) for sites. 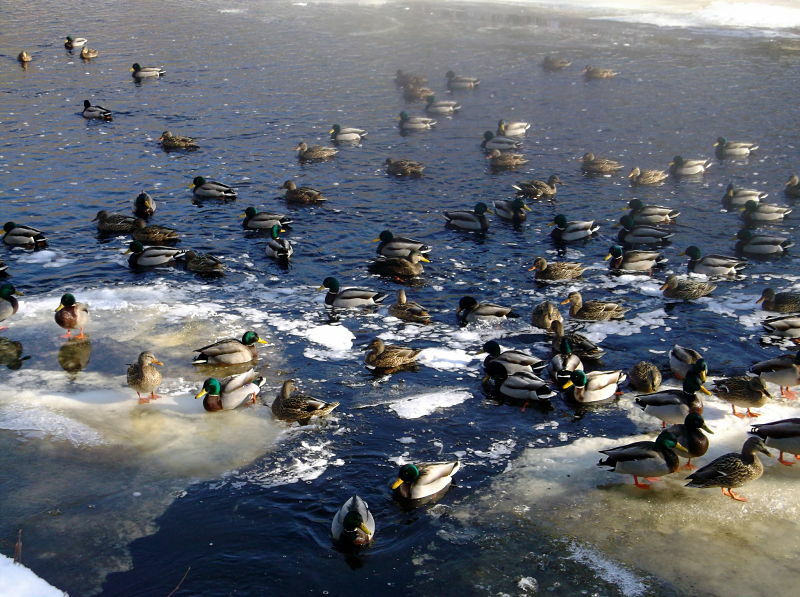 This was by far the highest observed Mallard abundance, while Mallards were uncharacteristically absent from Russells Mills Landing, again likely due to lack of ice which usually causes numbers there to surge. Nonquit Pond Canada Goose abundance was actually second to Cockeast Pond, where a whopping 1,006 were counted! Considering for both counts there were plenty of fields for geese to forage in, we can rest assured the population of Canada Goose is going strong!